I sweat, just like everyone else, especially here in Houston where both temperatures and humidity skyrocket from May through September. And sweat is important because it helps us stay cool in the summer heat. The key is that water has a high heat capacity, meaning it can absorb a large amount of heat energy before its temperature starts to rise. Try this experiment to see what I mean. Inflate one 12″ balloon with just air and tie it off. Add water to a second 12″ balloon so it is full when uninflated. Now, blow up the balloon with the water in it and tie it off. Be careful not to let it go unless you want a face full of water. Light a candle (kids, get a parent to help you!). Place the balloon with just air in it over the candle. What happens? Now, place the balloon with the water over the candle. Make sure the water is in the section of the balloon sitting on top of the candle flame. 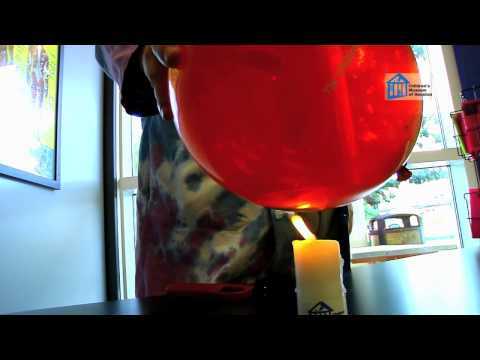 In the balloon with just air, the heat from the candle is pretty much absorbed only by the latex of the balloon, causing it to melt and pop. But, water has a very high heat capacity, which means that the heat energy from the candle that went into the latex was transferred into the water. So, the latex never got hot enough to melt and pop the balloon. So it is very important for us to sweat, as the water in our sweat absorbs the heat from our skin and our surroundings, helping to keep us cool. In order to sweat, we must be hydrated, which means drinking water at a rate of at least a cup an hour when out in the Houston heat doing anything strenuous (like playing in FlowWorks at the Children’s Museum of Houston). AVOID soft drinks and sugary fruit drinks as both will dehydrate you rather than hydrate you. Sports drinks are okay, but try to get the ones without a lot of sugar.